As the year progresses, the girls winter sports are having a pretty good season. Swimming has only had one meet so far and brought in a dub, Lindbergh’s first ever all girls wrestling team placed 2nd in the tournament, and Julie Baudendistel scoring her 1000th point. Varsity girls basketball have been doing exceptionally well. “Girls basketball is going really well this year. We just had a huge win against Oakville to win the Southside Classic for the third year in a row. The team always comes out confident and aggressive. We are a strong team with a strong bond,” Olivia Jones (12) varsity team captain said. It was a close victory with a final score of 56-55. 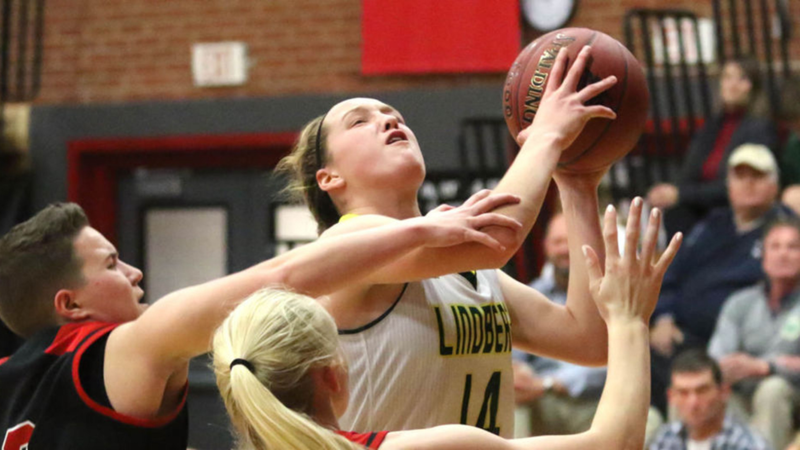 Baudendistel made Lindbergh history, being the 8th player to reach their 1000th point and was also recently named St. Louis post dispatch athlete of the week. Along with basketball’s great season’s start, the newly formed all girls wrestling team came out killing it in their first ever varsity tournament! “Drew Haase and Hailey Fisher both won first in their weight class, Earthis Pascua placed 2nd, and Julia Datus placed 3rd in her weight class,” Rachel Schmieder (12) said. The cheer team is also rolling on a high, placing first in this years state cheerleading championship.